The Mopar Enthusiast Ring is a online community devoted to Mopar Enthusiasts around the world. 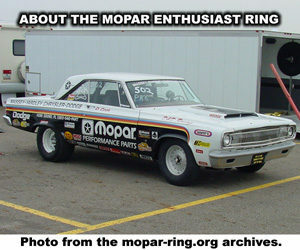 Started in late 1996, the ring is the oldest and largest Mopar Enthusiast ring on the internet. Built to promote Mopar related web sites and pages. The Mopar Ring is a great way to locate web sites containing information on Chrysler, Plymouth, Dodge and Dodge Truck’s including the adopted brands AMC, Jeep, Eagle etc. If you have a Mopar related web site or page, you can be a member of the Mopar Enthusiast Ring. Joining is totally free and is a great way to get more people to visit your site. By using the ring navigation bar on members contact pages, it is possible to travel from Mopar page to Mopar page, eventually ending up back at your starting point. You must have a club, personal or mopar related business site or page. You must be able to add a return link to The Mopar Enthusiast Ring. This link can be anywhere on your site or page. You must agree to and abide by the ring rules at all times. Step # 1 – Your site must meet the guidelines above; if it does not, it will not be added. Step # 2 – Submit a ring application to add your site into the queue. You will receive the Mopar Enthusiast Ring member linking information during this process. Step # 3 – Add your Mopar Enthusiast Ring member return link to your site/page. You must add your member link within 5 days or the site will automatically be deleted from the ring queue. Step # 4 – When you have added the Mopar Enthusiast Ring member return link to your site/page, send an e-mail to the ringleader asking to be added into the main ring. If your site qualifies according to the criteria above, and the Mopar Enthusiast Ring member return link is present and correct, your site will be added to the ring. You will be notified by e-mail when your site is officially added to the Mopar Enthusiast Ring. Cruising the Mopar Enthusiast Ring is a great way to locate web sites containing information on Chrysler, Plymouth, Dodge and Dodge Truck’s including the adopted brands AMC, Jeep, Eagle etc. Use the Previous, Next, Random Site or the List Sites to begin your Mopar surfing adventure. Question not answered? Need to contact the Mopar Enthusiast Ring concerning a feature or a problem viewing our site? Visit our help section for more information. The Mopar Ring Server is also the home of some cool Mopar stuff devoted to all Mopars. Including Classifieds, News, Screensavers, Wallpaper and more. Plus a selection of Mopar Connections devoted to specific topics like Chrysler, Dodge, RAM and more.